Screengrab from HuffPost Live’sHow Do You Define Latino Identity? interview. Huffington Post’s Test Kitchen is urging media and readers to rethink what it means to be Latino through the Latinos Break the Mold initiative. The interactive media project, which includes photo essays, audio recordings, and GIFs, has taken on a life of its own across social media with #LatinosBreaktheMold. The dialogue surrounding #LatinosBreakTheMold is one of cultural understanding, pride, and self-discovery. The project invites readers to witness the personal accounts of a wide range of artists, game changers, storytellers, thought leaders, and unapologetically proud Latinos in the Test Kitchen photo-essay and to participate in the conversation by sharing their perspective on Latino identity. “This is a glimpse into a community of limitless diversity connected by one ethnicity — proof that identity is far from skin deep. Latinos don’t fit into a Census box, a stereotype or a mold. Latinos break the mold,” state Huffington Post’s Carolina Moreno, Damon Dahlen, and Christy Havranek. Screengrab from HuffPost Live’s How Do You Define Latino Identity? interview. 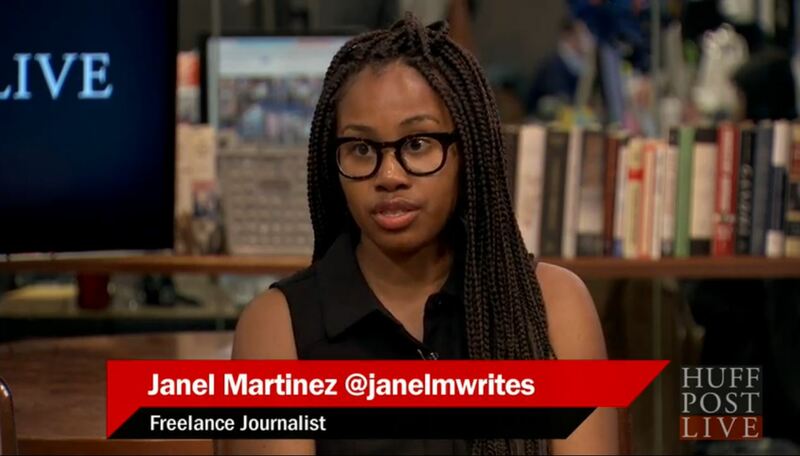 Janel Martinez speaks about her identity as a black woman and a Latina. The Latinos Break the Mold initiative creates a space for readers and participants to dig into the complexities of Latino identity. The project recognizes that Latino identity is difficult to define. In turn, Latinos Break the Mold aims to challenge the one-size-fits-all mentality of the “Latino” label by deconstructing stereotypes and creating a more inclusive dialogue around identity, diversity, and culture. Perhaps even more importantly, the Latinos Break the Mold initiative explores the intersection between media and social dialogue by creating interactive spaces for readers to share their stories and interact with the media’s narratives. As #LatinosBreaktheMold continues to grow, it will be interesting to see how people from other cultural identities are prompted to break socio-cultural molds.